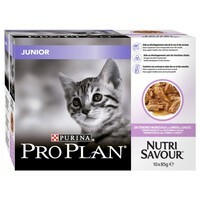 Purina Pro Plan NutriSavour Junior Kitten Wet Food Pouches are a complete and balanced wet food for kittens that contains all the essential nutrients they need during weaning and growth. Including DHA to support healthy vision and brain development, NutriSavour Junior has a nutrient profile adapted to help support healthy growth and also helps support healthy bones and muscle growth. My Siamese cat LOVES this wet food AND it has made his coat SO snooth. BUT the food does stink.